Often marketers are too busy producing white papers, blog posts, social media updates, etc., to stop and strategize. Unfortunately, the ugly truth is that if content production is not aligned with strategic foresight, it will fall flat. A colleague of mine suggested that marketers “work smarter, not harder, on content marketing efforts.” To do this, retrace your path and remake your marketing with a strategy and organized process for production. Get familiar with your buyer. Conduct discovery research to find out what problems they commonly face. Dig deeper to expose leading causes and uncover success factors. Observe current activity online. What social networks do they use? What publications do they read? With a comprehensive understanding of target personas, brands can more easily (and strategically) relate. A targeted piece of content, relevant to buyer pain points and interests, is more likely to be shared and valued. Buyer becomes aware of a need. Buyer begins the search for a solution. Buyer evaluates options and compares your product to other leading brands. Buyer makes a purchase decision. Buyer demonstrates post-purchase behavior, based on experience. 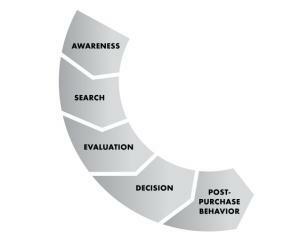 At each stage in this cycle, the buyer seeks different information and answers related to your brand. Keep this in mind while mapping content, and seek to provide the information needed—at the exact moment it’s required. To aid in topic brainstorming, list the typical activities and common questions at each stage. These topics often make for the most versatile, evergreen content that can be repurposed in lead nurturing efforts. There is no universal secret to organizing content production. The absence of a standardized process, however, can ultimately lead to total content chaos. It’s one of many reasons why content marketing software tools have exploded in popularity. As you build your content production process, consider the gaps or problem-areas that exist in your current process, and ways to alleviate them. Remember, not all organizations need dedicated software to manage content efficiently. A smaller organization may be able to function successfully with simple tools—for example, Google Drive coupled with a project management application. A larger enterprise, however, may need something more sophisticated like digital asset management. Number of writers, editors, etc. Explore your options. Download our free content marketing tools guide, which spotlights 8 content marketing solutions. The guide includes key software features related to organization, workflow management, editing, measurement and more. We've even included pricing information (if available) and whether each solution offers a free trial. Each tool offers features that can, if used strategically, truly advance your content marketing practice. Below is a list of the tools reviewed by PR 20/20. Download the guide to investigate further and discover what aligns best with your strategy. Kapost: A user can segment content pieces by campaign. You can manage a variety of content types including video, eBooks, social media, emails, webinars and more. DivvyHQ: This tool provides a “Parking Lot” feature that saves content ideas in one place. The DivvyHQ application is centered on the calendar feature. GatherContent: Create a piece of content within the portal and send through the entire editing process, without moving or resaving in a new location. When you’re finished, export your document to the desired CMS. MindJet: The portal includes an interaction mind map. It gives your team the ability to collaborate and brainstorm within one non-linear portal. Basecamp: Basecamp is an extensive project management portal, allowing your team to produce, assign tasks, and discuss projects company-wide. Contently: Contently is a software platform, with the advanced ability to manage outsourced writers. The writer marketplace has more than 7,000 qualified writers. Google Drive: Google Drive is a free web-based drive that allows you to share documents and edit in real-time. All changes are automatically saved. To enhance your drive, download applications (like an analytics dashboard). Podio: Podio offers the flexibility of a customizable workspace. Create your own detailed projects and campaigns or build your own apps. For a more detailed look at content marketing software vendors, we suggest Content Marketing Institutes’ newly released technology report written by Chief Strategist Robert Rose (available by purchase only): Content Collaboration Tools: An Analysis of 13 Technology Solutions in a Disruptive Marketplace. Within the report, Rose takes a deep dive into the features and functionalities of 13 differing solutions. How does your business organize content production? Would you recommend a content tool not mentioned in PR 20/20’s guide? Feel free to share below.